Chinatown Solstice Birthday Scavenger Hunt! Saturday, December 20th, 3:42PM, at Cafe de la Presse on Bush & Grant. Prepare for a few hours of scavenger hunt fun, as we sample dumplings, find crystalized seahorses and sneak through tiny alleys. Teams formed as you arrive. End-up location is a super secret (unless you call me with a good excuse). Good idea to bring umbrella, digital camera, and a sense of adventure. 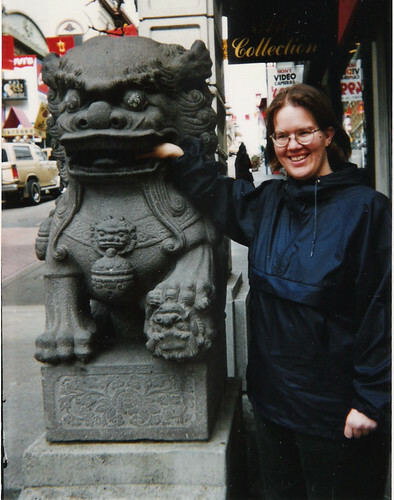 Photo: when I was 25 maybe, I visited with my friend Ann and took this cheesy tourist photo, never suspecting I would one day live here, in SF, and actually a few blocks from Chinatown! Written Tuesday, December 2nd, 2008 in local color. You can leave a response, or trackback from your own site.